This is one of my favorite library related postage stamps. I like it because creating a nation of readers is one of the most important missions of America's libraries and because it is simply a beautiful stamp. It is the third of three library stamps approved by Postmaster General William F. Bolger and designed by Bradbury Thompson, one of the world's greatest graphic designers. This stamp was issued on October 16, 1984. 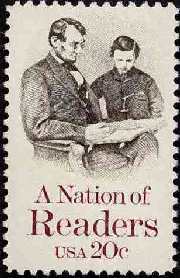 The other two stamps (the America's Libraries stamp and the Library of Congress stamp) were issued in 1982. The photograph on which the stamp is based is located in the Library of Congress and was taken by Anthony Berger, Mathew Brady's assistant, on Feb. 9, 1864. Although it appears that Lincoln is reading to his son Tad, they are actually viewing a collection of Brady's photographs. John Y. Cole, Director of the Center for the Book for the Library of Congress, was instrumental in promoting the 1984 A Nation of Readers stamp. 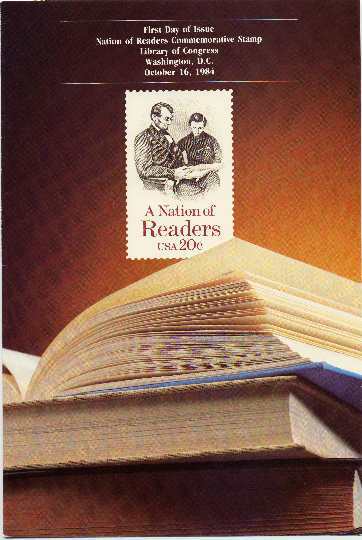 "A Nation of Readers" was the theme for National Library Week in 1985. The first day of issue ceremony for the stamp took place in the Coolidge Auditorium of the Library of Congress on October 16, 1984. Librarian of Congress Daniel J. Boorstin gave the welcome; Postmaster General William F. Bolger gave the address; and Bradbury Thompson was in attendance as an honored guest. 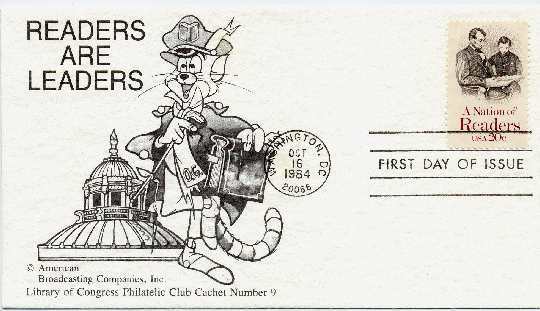 This first day cover for the "A Nation of Readers" stamp which was issued on October 16, 1984 was Cachet Number 9 for the Library of Congress Philatelic Club. The cachet features Cap'n O. G. Readmore and the dome of the Jefferson building of the Library of Congress. The Readmore character was created jointly by the LOC Center for the Book and ABC Television to help promote reading. John Y. Cole, Director of the Center for the Book, was instrumental in promoting both the 1982 Library of Congress stamp and the 1984 A Nation of Readers stamp.